Chesterfield manager Martin Allen was delighted with his side’s endeavour as they came from behind to win 3-1 at AFC Fylde to earn a place in the FA Cup First-Round Proper. Danny Rowe struck early on for the hosts, however Allen’s side fought-back with two goals later in the first-half from Will Evans’ free-kick and Tom Denton’s penalty. Denton secured the Spireites’ progression at Mill Farm with 20 minutes left to play when he powered in a header from a corner kick. And Allen, who was appointed in the summer following the club’s relegation into the National League, feels his men fully deserved their victory on the Lancashire coast. 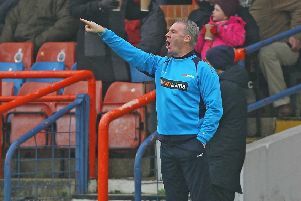 He said: “I think it was an improvement, we stuck to our game plan and attacked them, and I thought it worked very well. “I don’t think we started the game that well but as the game went on, we got stronger and stronger and I think it would be fair to say that we deserved to win. “I’m pleased with the overall attitude of the players, the last few weeks have been a testing time after some very disappointing performances, it wasn’t good to watch, it wasn’t good to support, it wasn’t good to play in. Following a difficult start to life in the fifth-tier, Allen hopes that that the run of four games unbeaten will represent an upturn in fortunes for the Derbyshire side and their supporters. And Allen wants to keep the momentum going throughout the course of the season. Allen added: “We can say well done for the FA Cup win, but the importance now of four games unbeaten, we’ve had a big turnaround and worked extremely long hours on the training pitch and I’m looking forward to next Saturday’s game in front of our own supporters.